Operating a Trumpf tc200 punching machine we are able to punch shapes and perforations in mild steel, stainless steel and aluminium. We can punch to materials up to 4mm mild steel, 5 mm aluminium and 3 mm stainless steel. We are able to punch louvers to a size of 60x12. With our rollers we can work with material thickness up to 5 mm by 1250 mm wide. With a team of highly skilled fabricators we are able to weld mild steel and stainless steel. 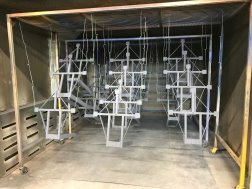 Amongst the services we off we are able to powder coating in house and have local suppliers for zinc plating and galvanizing. With our own box oven sized at 2.8 wide, 4m deep and 2.4 m tall we are able to powder coat a range of sized products. We stock a range of standard colours, alternatively customs can be pre ordered. We work closely with a number of companies specialising in laser cutting, so as to enable us to obtain the best price across a range of materials and thicknesses. Using solid works 3d modelling package we are able to work with customers to produce and design new products in addition to improving existing products. For example the design service usually begins at the design stage. Initially determining best materials and design to meet budget demands. A prototype is then manufactured for testing prior to full production.